Dec 18, 2013; Columbus, OH, USA; Ohio State Buckeyes forward LaQuinton Ross (10) talks with head coach Thad Matta early in the game against the Delaware Fightin Blue Hens at the Schottenstein Center. Ohio State hasn’t played the toughest non-conference schedule, but it has done away with each of its 11 opponents by double figures. With plenty of tough Big Ten competition awaiting, the third-ranked Buckeyes’ final major non-conference test comes Saturday night against Notre Dame in the Gotham Classic at Madison Square Garden. Ohio State (11-0) hasn’t allowed 70 points this season and is holding opponents to 55.5 per game behind a perimeter defense that has been among the best in the country, limiting the opposition to 24.7 percent from 3-point range. "They really are machine-like," Notre Dame coach Mike Brey said. But after Wednesday’s 76-64 home win over Delaware, the Buckeyes saw plenty of room for improvement heading into their New York City date with the Fighting Irish (8-3). "Sometimes you have games where it’s not clicking the way you want it to," Ohio State coach Thad Matta said. "The difference between good teams and great teams is great teams can figure it out. We did momentarily at the end of the first half, but we couldn’t sustain it." Following a 15-0 mid-game run that built a 14-point lead, Ohio State allowed Delaware to trim it to single digits with under 2 minutes remaining. LaQuinton Ross scored 19 points to lead five Buckeyes in double figures. They shot 40.7 percent after hitting 55.8 percent in their previous five games. "They contested shots and took us out of our first look," Buckeyes guard Aaron Craft said. "We missed some layups early and that affected us a little bit. Sometimes you have to find a way to win when you are not able to put the ball in the bucket." The Fighting Irish beat Indiana 79-72 Saturday in the Crossroads Classic to rebound from a Dec. 11 home loss to North Dakota State. Jerian Grant had 23 points and nine assists, and center Garrick Sherman scored 16 on 6-of-7 shooting to reach double figures in a career-best eight straight games. "I think we were able to get three front-line guys giving us great energy," Brey said was the difference. "Sherman’s been there, but (Tom) Knight and (Zach) Auguste, rotating those three guys, that really helped us. God, we blocked 10 shots. We were big around the bucket, we got some putbacks. Those guys are really important to taking the pressure off the perimeter having to do too much." Along with their loss to the Bison, the Irish have dropped games against Indiana State at home and at Iowa. An upset of Ohio State would help them feel quite a bit better about their non-conference slate as their first run through an ACC schedule nears. While the results have been mixed, Notre Dame has consistently taken care of the basketball. The Irish have turned it over an average of 8.8 times in their last six games and are among the best in the country with a 1.90 assist-to-turnover ratio. "They’re very fast-paced. 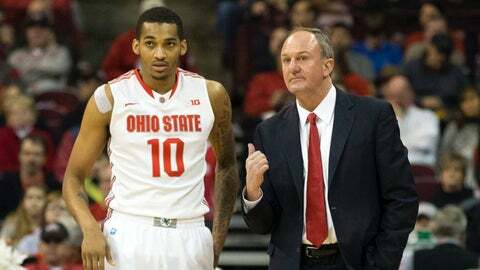 Their assist to turnover ratio is ridiculous," Matta said. "… They’re very intellectual in how they play. They space. They drive. They’ve got guys that can really shoot the basketball. If you fall asleep, if you take a break for a second, they’re going to score at the other end." The teams haven’t met since Ohio State beat Notre Dame 67-62 at Indianapolis on Dec. 6, 2008. The Buckeyes lead the all-time series 7-5, though they’ve played only twice in the last 40 years. Notre Dame has won two of its last three against top-5 teams.